Halt got out of his car, stretched, and turned on the cameras embedded in his contact lenses. The sun was bright. The sky was clear. "Hello, Zadie!" said Halt, adjusting his ear-piece. "Can you hear me?" There were birds singing in the background. Traffic too, but the birds were louder. "Yes, Daddy, I hear you." said Zadie. "I can see too." she added. She sounded tired, Halt thought. She had probably been asleep while he was driving. "Well, this is the place I was telling you about." said Halt, sweeping his head around to give her an establishing view. "This isn't really the best part." Halt apologized. The front of the park really did look bad. There was litter everywhere, and weeds growing up through cracks in the old concrete parking lot. Halt wished he had waited a little before calling up Zadie. He had been hoping to give her an uplifting experience-- to get her out into the fresh air, in a manner of speaking. But it had been so long since he had come to the Memorial Park, he had not realized how far into neglect it had fallen. Halt walked down the short flight of steps to the Front Park. This was better. There was the broad expanse of grass, green and alive. There was a little puddle of mud at the base of the stairs that he had to jump over. Zadie laughed as he did, and Halt smiled. "This is the Front Park." said Halt, looking from tree to tree to tree. The grass was uncut, and the trees were untrimmed, but it was all so green it almost looked better that way. "Your Grandma used to bring me here a lot when I was your age. It hasn't changed that much... except there used to be more people." "How many people?" asked Zadie. As he walked, Halt looked at the small group of men playing football at one edge of the parking lot, and at the old woman reading a book under one of the trees. There was no one else in the park. "I don't know." he said, "I never counted or anything, but a lot more this. There used to be a wooden gazebo over there," Halt pointed to an empty space in the trees, "where they would have live music on Sundays, and people would bring blankets and have picnics on the grass all through here. Yeah. Used to be a lot more people. Never crowded, like uncomfortably, but always a lot more than now." "What's that over there?" asked Zadie suddenly. "Back there, where you were just looking a second ago." Halt turned his head slowly, scanning across the park. "Oh! That is the playground." Halt said with a smile. He walked briskly towards it. The square of sand that had once framed the playground was gone-- or rather, not gone, but covered by the encroaching grass. 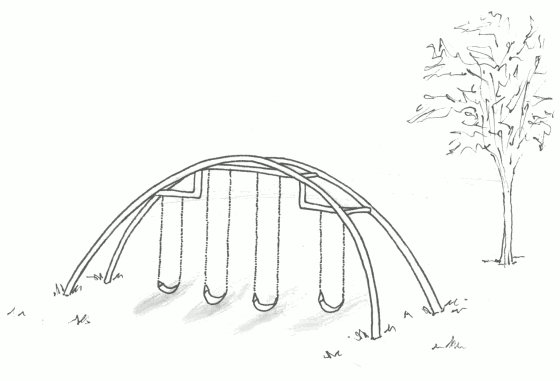 It now grew right up to the base of the swing set, but not, Halt noticed, directly beneath the swings. There were grooves in the ground beneath each swing, evidence that children still came here to play, but the mud from last week's rain storm was undisturbed, evidence that children didn't play here every day. "I know what this is." said Zadie, "This is a swing! How does it work?" Halt wrinkled his brow, surprised by the idea that his daughter wouldn't know how a swing set works... but now that he considered it, it wasn't so strange. The playground was a relic of an older generation, and Zadie had never been well enough to spend much time playing outdoors. Zadie sensed her father's hesitation. "Well, of course I know how it works." she said quickly, "I've seen them on TV and in movies. But I don't know HOW they work. I mean, they're obviously not powered." "Umm... well," said Halt. "You just sit in them and swing." He reached out and touched the chain of the nearest swing. All the metal in the playground had the hint of rust to it, and all the plastic was sun-faded, though otherwise everything was in good repair, and showing no signs of falling apart. "Wait a moment. I'll look up a clip." said Zadie. "No, Don't go." said Halt quickly. "Here, I'll show you how it works." He stepped into the shallow trench and brushed the low seat with his hand, and sat down. "Hmm, been so long since I have done this." he said. He kicked back against the ground to start, leaned back, kicked forward, and he was off. Halt's legs were too long for the swing, and his shoes splashed through the mud on each pass. No matter. He had deliberately worn old clothes today just so he could do things like this. "It's all about shifting your weight." He explained. "Kick when I go this way... Lean when I go this way." Zadie laughed again. "You look so funny, Daddy!" Halt looked at himself as his legs pumped into the air above him on the forward swing. He did look funny. He didn't care. He could hear the joy in Zadie's voice. "Is your Mother in the room?" asked Halt. "No, she already left for class." said Zadie. "Okay," said Halt, looking around instinctively. "Don't tell her about what I'm about to do." At the peak of his swing, Halt jumped from the swing, and for a brief breathless instant, he was airbourne. Zadie screamed. He hit the ground running, and stumbled to his knees, laughing. "That's always the best part!" he exclaimed. "Daddy! That was wonderful! We were flying!" bubbled Zadie. "Do it again!" "I'd better not." Said Halt, pulling himself upright, and rubbing the pain out of his legs. "I'm not as flexible as I used to be. Ouch!" He looked back at the swing set, one swing still dancing with the recoil of his jump. "But when you get better," he added, "We'll come here together and you can try it for real-- well, maybe not the jumping part, but the swinging, yes." Zadie was abruptly silent. Halt could actually hear her holding in her breath. "I'm NOT going to get better." she spat out bitterly. "Don't talk like that!" said Halt desperately. He shouldn't have said it. He knew he shouldn't have said it, but he had gone and said it anyway, after he had promised himself he wouldn't. But now that it was said... "You ARE going to get better Zadie, and when you do, we'll come and I'll show you--"
"No, don't YOU talk like that." said Zadie. "You always say I'll get better, and I never do. I'm only going to get worse. Wishing can't stop it. Saying it won't doesn't change what's going to happen." Halt could hear the emotion at the edge of her voice. Any other kid would be crying right now. He had never known anyone but Zadie to be so good at holding back tears at such a young age. He almost wanted to cry himself. He stared at the sky, just to stop himself from staring at the ground. Neither of them said anything. Who taught her to hate hope? Halt wondered to himself. Halt wandered away from the playground. There at the far end of the Front Park was the big concrete bunker with the Memorial Statue in front of it. Far beyond were the mountains, green hued through the clear air. It was me. Thought Halt. I'm so full of faith and hope all the time that she has become dead to it. I'm like the Boy Who Cried Wolf. She's right. I say she will get better, and she only gets worse. Of course she wants me to stop saying it. It's only natural. Halt walked towards the Statue. Was she still watching? Halt could tell that Zadie had not disconnected, but he couldn't know if she was still watching; if she was still listening. Halt stopped at the base of the statue. It depicted eight people standing in various positions around a central empty space. The sculptor had been talented. The negative space was powerful. What was not there was every bit as important as what was there. "Are you there, Zadie?" Halt asked. "I'm sorry, Zadie," Halt began. "No, I'm sorry." said Zadie. "Let's not talk about it." Her voice was tight, with a forced brightness to it. Halt could tell his daughter was making herself smile. "Do you know what this is?" Halt asked, eyes playing over the statue, from one face to the next. "Yes. I learned about this from school." She said. Halt looked down at the plaque. Zadie read it aloud. "Dedicated to the memory of the brave men and women who gave their lives in the pursuit of the advances in physics and scientific understanding that have so shaped our century." There were eight names engraved below, but Zadie didn't read them. Halt walked around the back of the Statue. Although each figure was in a different pose, as if each interrupted from a different task, all eight pairs of eyes were turned inwards towards the central empty space. "None of them knew they were going to die, did they?" asked Zadie. "No." Said Halt. He turned away from the Statue, and walked along the edge of the enormous concrete bunker. There was a plaque in front of it too, but Halt did not stop to look at it. Behind the bunker was a high earthen berm covered with bright green grass. There were a few concrete steps at the base of it, but the rest of the path over it was just a rough track worn into the grass. Few feet went this way. Halt climbed to the crest of the berm, and as he saw over it, Zadie gasped. When he reached the top, he stopped, and looked very slowly from left to right across the whole vista. The earthen berm was not a straight line, but a gentle curve, describing the perimeter of a sixty-four kilometer ring between the arms of the mountains. In the center was lush green forest; Nothing but forest, and just a hint of the gleam of light off the surface of a lake in the center. "This is the Back Park." said Halt. "Nobody ever comes here." said Halt. "I never understood it. Even back when the Front Park was popular, nobody ever went down into the Back Park. I used to hike out there for hours and hours, and most days I wouldn't meet anybody else at all." For a while they both said nothing, but Halt could hear her watching. Birds sang and chased each other through the air over the vast valley of the Back Park. Finally Halt reached into his pocket, and withdrew a small wad of paper, and carefully unfolded it. It cracked with age. It was an old printout from a long defunct news-site. Halt stopped reading. The rest of the article was cut off the end of the page. There was a faded picture along the side of the text, showing Tumaini the Elephant, and her handler from some time before the accident. He looked at it for a moment, and then his eyes drifted back up and out at the Back Park. "Is that true?" asked Zadie. "I dunno." said Halt. "But I sure spent a lot of time out there looking for that Elephant. Maybe when--" Halt's stomach knotted at the thought of what he had started to say. How could he not say it? It was what he felt. It was what he believed. It was what he wanted to believe. She would hate him if he said it, but how could he stop himself? "Maybe when you're better, we can come back here and look for old Tumaini together." Halt finished, snapping his mouth tightly shut as the last selfish syllable escaped. Zadie was quiet for a long time. Halt didn't know where to look. Finally she said, "No, let's go look for her together now." Halt looked at the hint of the light of the lake. The air was warm, the sun was still low in the sky. He was sure that Zadie could see the tears in his eyes, washing over his contacts, but he was smiling, and he was sure somehow that she knew that too. "Okay." he said, and started down the slope into the Back Park, to search for the Last Elephant with his daughter. The contents of these stories are words, and as such, they are to be read, and remembered, and above all, shared. These words belong to you who read them, but these words also belong to he who wrote them. Please respect his ownership of them.